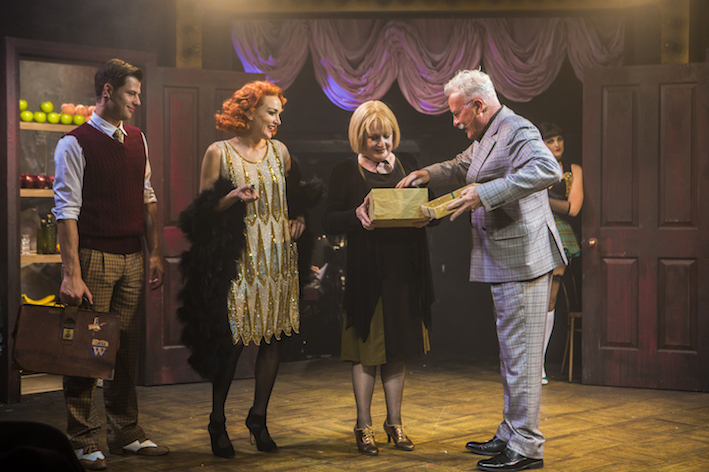 Although its timeless quality and eerily prescient politics make Cabaret ripe for revival, a proliferation of poor directorial choices derails the promise of this new production. Ahead of its time in 1966, Cabaret startled audiences by merging a traditional book musical with the avant-garde stylings of a concept musical, a form that producer/director Harold Prince was not to explore further until the early 1970s. 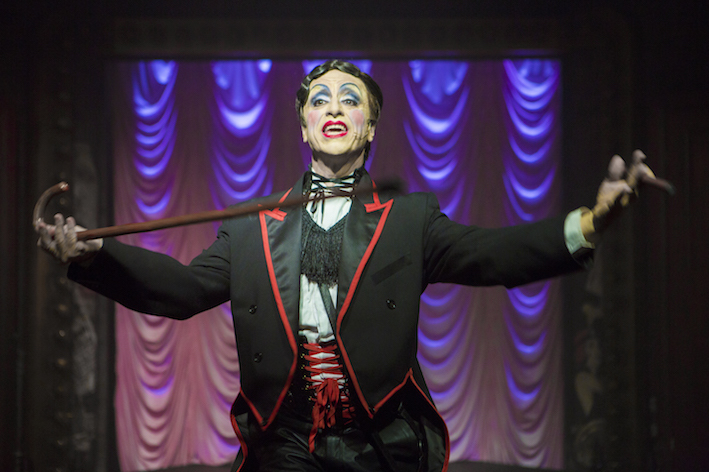 Interspersed between the scenes at Fraulein Schneider’s boarding house and Herr Schulz’s fruit shop were abstract, musical numbers on the stage of the decadent Kit Kat Klub. These numbers provided oblique social commentary on the action, providing food for thought for the imagination of the audience. Direction for this new staging of Cabaret, which is credited to Gale Edwards in Melbourne, blurs the lines between book scenes and social commentary numbers to the point of destroying the original intent of book writer Joe Masteroff, composers John Kander and Fred Ebb and original director Harold Prince. When Cliff joins “Two Ladies,” and when Ernst and Cliff join “The Money Song & Sitting Pretty,” it is not clear in what realm these moments are occurring. When a chorus boy walks on stage and sings “Tomorrow Belongs To Me” there is not even any effort at a context. Rather than impactful, these numbers become fanciful and trivial. Following the emerging conflict of Fraulein Schneider being engaged to Jewish man Herr Schulz, the commentary device seems to actually be working in “If You Could See Her.” In this song, the Emcee boasts of his lady love, whom we clearly see is a gorilla. At the end of the song, however, audience intelligence is given a slap in the face when the Emcee lifts up the mask of the gorilla to show us that it is actually Herr Schulz. The powerful effect of the final whispered line “…she wouldn’t look Jewish at all” is completely lost. Given the quality of the sound design (Nick Walker, Andrew Worboys), it is presumed that the excessively high volume is another directorial decision, in line with the general concept of hitting the audience over the head with the material. The loudness, combined with the strident direction, means that none of the performances are given the chance to draw the audience in. Sally Bowles has no air of mystery, Fraulein Schneider has no chance to display vulnerability and Herr Schulz has little chance to cultivate sympathy. Even the deliberately unlikeable characters of smuggler Ernst Ludwig and prostitute (and Kit Kat Girl?) Fraulein Kost lose their seedy edge. 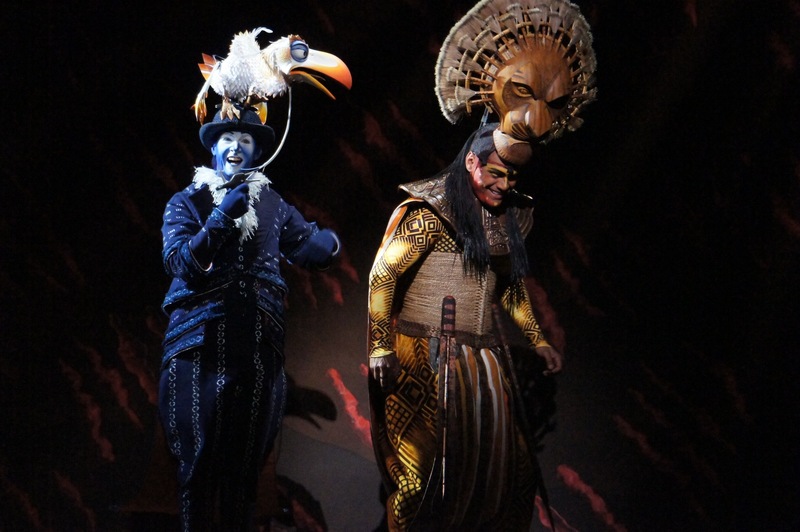 The 1987 Broadway revival version is used in the production, and this is much more closely related to the 1966 original than the more recent Sam Mendes production. Audience members who only know the show through the 1972 movie will miss “Mein Herr” and “Maybe This Time,” but will appreciate the inclusion of a little of “The Money Song” within “Sitting Pretty.” Rarely heard lament “Don’t Go” is sung by Cliff, replacing original number “Why Should I Wake Up?”. The Emcee finishes with searing ballad “I Don’t Care Much,” although the character suffers the indignity of moving a chair off-stage as he sings. The black and gold proscenium arch of the Athenaeum Theatre is an ideal match for the seamy faded glory of James Browne’s light globe-studded single set. Café tables and chairs are set up at the front of the auditorium to create the Kit Kat Klub vibe. 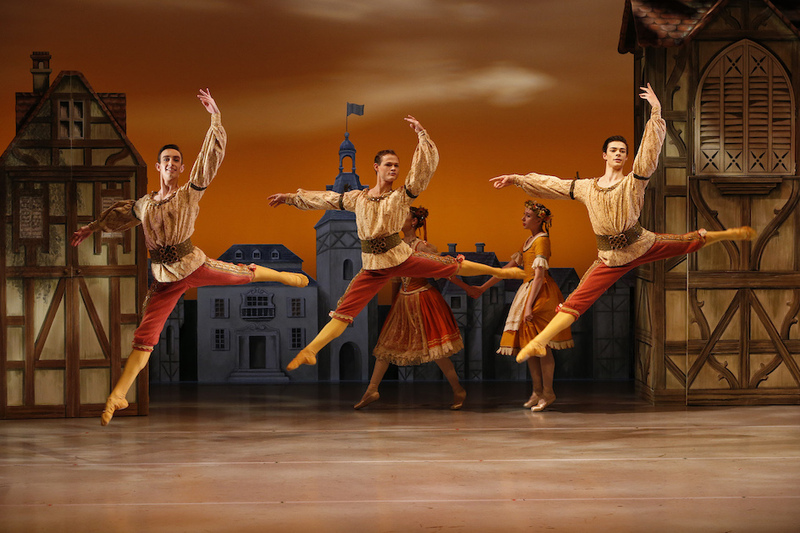 Browne’s costumes are highly attractive, although their authenticity is generally undermined by being a little too pristine. It seems an odd choice for the four chorus members who are Kit Kat Klub dancers to each have an individual look, but at least this makes it less distracting when actors in other roles join in to swell the ranks of the dancers. The gradual change to Nazi uniforms for the chorus is one of the few subtle points of the night. Making good use of a tight stage space, choreographer Kelley Abbey keeps the dance numbers slick and lively. Chelsea Gibb makes the role of Sally Bowles her own, and gives a mighty rendition of well-known title song “Cabaret.” Gibb maintains the energy of a woman surviving precariously on the edge through sheer force of will. Exuding a highly likeable stage presence, Jason Kos gives a breakout musical theatre performance as Cliff. The increased focus on Cliff’s bisexuality detracts from his love affair with Sally, and the character’s participation in Klub numbers brings a superficiality to the drama Cliff is witnessing. The winning appeal Kos’ natural charm makes him one to watch in the future. Paul Capsis is an inspired choice for the gleefully malevolent Emcee. In another odd directorial choice, the Emcee spends much of the time sitting side stage in the half dark like a disobedient child sent out of the room; he does, however, come to life in his musical numbers. 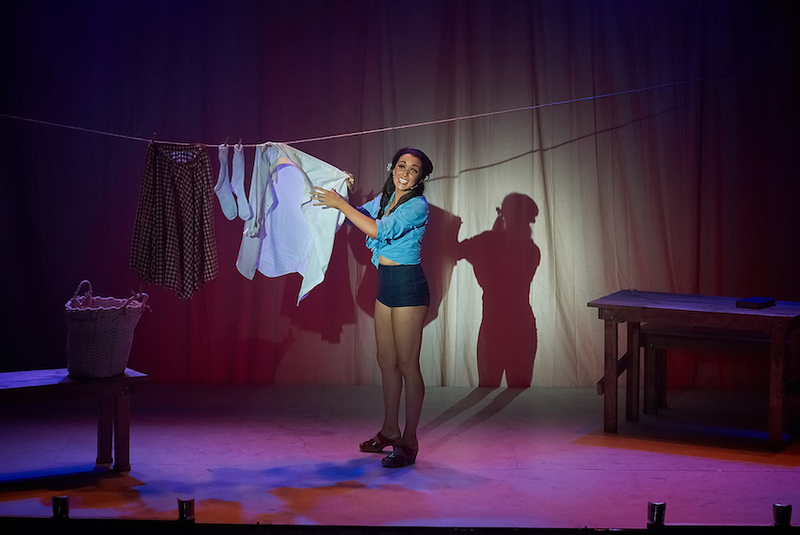 Undermined by fast tempi and loud volumes, and slightly hampered by pitch issues, Kate Fitzpatrick nonetheless maintains a grounded, world-weary presence as survivor Fraulein Schneider. Veteran musical theatre performer John O’May makes a welcome appearance as kindly fruit shop proprietor Herr Schulz, successfully managing to convey a gentle tone despite the high volume acoustics. Sterling talent Debora Krizak is reliably magnetic as Fraulein Kost, just as experienced veteran Michael Cormick is sweetly charming as Ernst. Both Krizak and Cormick are enjoyable to watch despite their loathsomely self-serving characters being bereft of their grit, pathos and menace in this production. 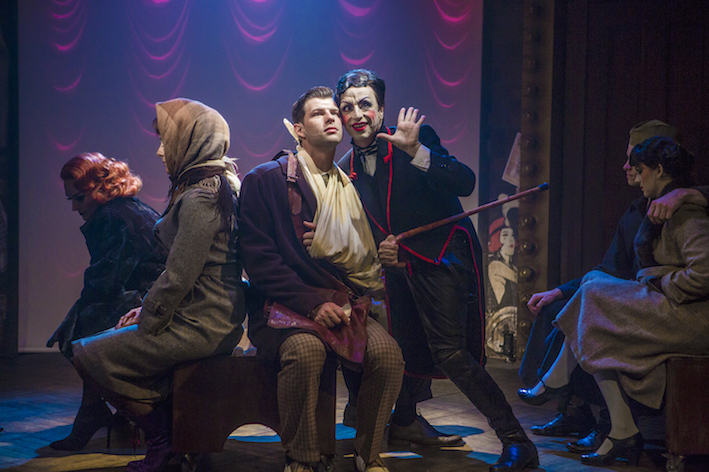 The enduring appeal of Cabaret, the considerable talents of the cast and the potential timeliness of this season make the shortfalls in this production all the more disappointing. Cabaret plays at Athenaeum Theatre, Melbourne until 20 May 2017.